The line between tragedy and comedy is a thin one for sure. What is funny? When is something funny and when is something not funny? How do we know we’ve crossed it? Riding the line between comedy and tragedy is something that a lot of independent films tend to struggle with you. You make something too dark and it saps the humor out of the situation. You do it that way and you are left with a drama with funny people in it. You make something that’s serious funny and you have crossed the line. You are poking fun at something that shouldn’t be poked fun at and the audience turns on you. But sometimes, you find the film that rides that line perfectly. A film that is both funny and moving. Entanglement is that film. 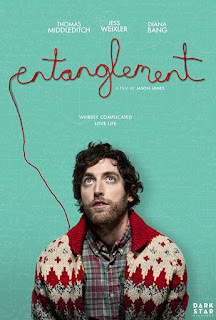 Entanglement is the story of Ben Layten (Thomas Middleditch). Ben is a recent divorcee who is down on his luck. He leads a miserable, jobless life that is spent wondering where did everything go wrong. After several unsuccessful suicide attempts, he ends up befriending his sarcastic, yet helpful neighbor Tabby Song (Diana Bang). While constructing how his life fell apart through quantum entanglement, Ben learns that he almost had an adoptive sister (Jess Wexler). Feeling that this is the key to his happiness he sets out to find her only to learn that he has met her before. Ben falls in love with her and learns that life and love is far more complicated than he thought. Like many indie comedy dramas starring comedians, Entanglement at first seems to be another member of the passive unshaven man-child who learns to grow up subgenre. Love is what will save him from the fact that the universe mostly is a terrible dumpster fire. Fortunately, this isn’t the case. We soon discover that this film is a bit darker while also still having a beating heart. Director Jason James has directed a film that intends to be more than just your average indie comedy. Entanglement has more ambition and charm than some of the contemporaries with a script that will constantly keep you guessing. While the cast is exceptional all around, Thomas Middleditch carries this film all the way home. He has made a career out of playing passive men who wonder about their place in the universe and he has never been better than he is here. The character he plays in here is a darker extension of that, showing off a range of emotions that he hasn’t shown before in his previous roles. This is a character on the verge of killing himself when we first meet him. We both laugh and hope that Ben finds his place in the universe. As I watched Entanglement, I want to spend more time with these characters and the world they live in. The humor while dark at times kept me laughing and connected me with these characters. The dramatic moments worked and I felt that I was watching Middleditch come into his own as an actor. I hope that Jones and Middleditch keep working together because this film shows that they are capable of much more.